1. Preheat the oven to 220˚C, gas mark 7. Toss everything for the sprouts together and roast for 25-30 minutes, tossing every 10 minutes or so. The sprouts should be crisp and golden on the outside and soft on the inside. 2. Meanwhile, toast the almonds in a dry pan until slightly coloured; set aside to cool. Heat the oil in a saucepan over a medium heat. Add the fenugreek seeds and cinnamon; stir for 30 seconds. Add the garlic and onion and keep stirring from time to time until they are soft but not coloured – 5-10 minutes. Add the turmeric and cook for 30 seconds more. 3. Add all the remaining ingredients except the lime juice and chilli oil. Bring to a gentle simmer and cook for 10 minutes. Do not let it boil or the coconut milk might split. Finally, season, take off the heat and add the lime juice. 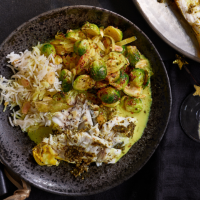 Pour over the crispy Brussels sprouts, drizzle with the chilli oil, scatter with the toasted almonds and serve immediately with the sea bream and basmati rice (left).